For four years in the late 1980s, a small group of campaigners in London maintained a continuous protest outside the South African Embassy in protest at apartheid. They were calling for the release of Nelson Mandela and all political prisoners in South Africa and Namibia. Their Non-Stop Picket of South Africa House kept going, day and night, until Nelson Mandela was released from gaol in February 1990. Gavin Brown writes, for the last three years, Helen Yaffe and I have been recording the history of the Non-Stop Picket. In this post, I examine the role of camps and long-term protests in the international campaign against apartheid. The Non-Stop Picket was launched on 19 April 1986 in the context of ongoing unrest and mass mobilizations in South Africa. 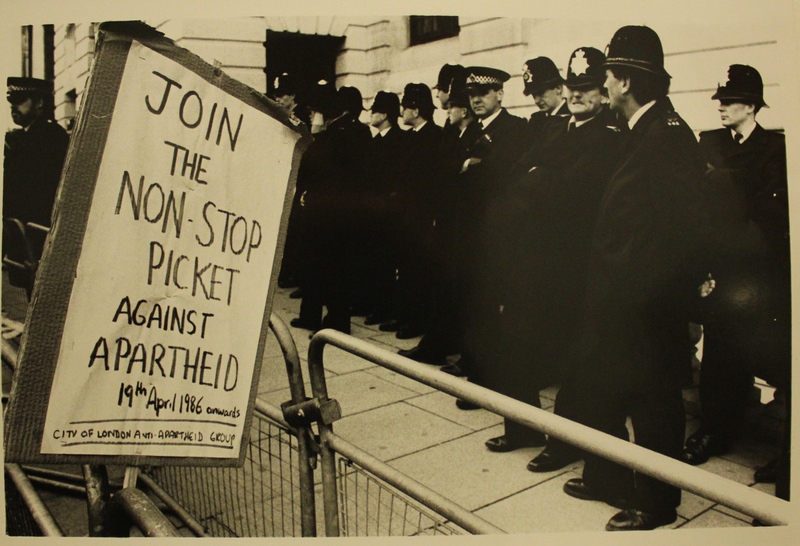 At the time, the City of London Anti-Apartheid Group (who organised the Picket) probably over-estimated how close the apartheid regime was to collapse. Few of the original picketers who we have interviewed really believed, at that point, that they would need to keep the Picket going, non-stop, for the next 1408 days and nights. The Picket occupied a few square metres of pavement outside embassy for nearly 46 months without anyone camping there. To keep going, the picket relied on a weekly rota. Each day was divided into three or six-hour shifts, and individual supporters pledged to do a regular shift each week (or as often as they could). Some shifts survived with just two or three regular picketers, others could attract dozens each week. Attempts were made to fill any gaps in the rota for the week ahead at the group’s regular Friday meetings, and one volunteer was always on call to respond to unexpected shortfalls and emergencies (like the couple of times the police arrested the entire protest). Without anyone living on site, the Non-Stop Picket did not have to provide many of the practical ‘re-creational infrastructures’ (Feigenbaum, Frenzel and McCurdy 2013) common to many protest camps. Picketers used nearby public toilets or the facilities in the area’s many cafes and fast food outlets. These were also the places were picketers went to eat during breaks or at the end of their shifts. But food was provided in others ways too – one of the Picket’s older supporters (who was unable to sustain standing on the protest for any length of time) would drive down once a week to deliver home-made vegetarian pizza; the staff at local restaurants would donate unsold food at the end of business; and passing supporters would unexpectedly deliver a round of hot drinks or snacks. Protest camps are often thought of as exceptional spaces; but, in many ways, the longer the Non-Stop Picket existed, the more it inserted itself into the everyday rhythms of central London. The Non-Stop Picket in London was not the only long-term anti-apartheid protest to target one of South Africa’s overseas diplomatic missions. The City of London Anti-Apartheid Group had organised a previous non-stop picket in London in 1982. On that occasion, they stayed outside the embassy for 86 days demanding that David Kitson (the imprisoned husband of the group’s founded) and other political prisoners in South Africa should be moved off Death Row in Pretoria. That picket ended when David Kitson and his comrades were moved to ‘healthier’ prison accommodation. In the year before the Non-Stop Picket for Nelson Mandela was launched in 1986, anti-apartheid campaigners in the United States protested outside the South African Consulate in Washington DC everyday for a year (1984 – 1985). The longest anti-apartheid embassy protest, however, was probably in Canberra. 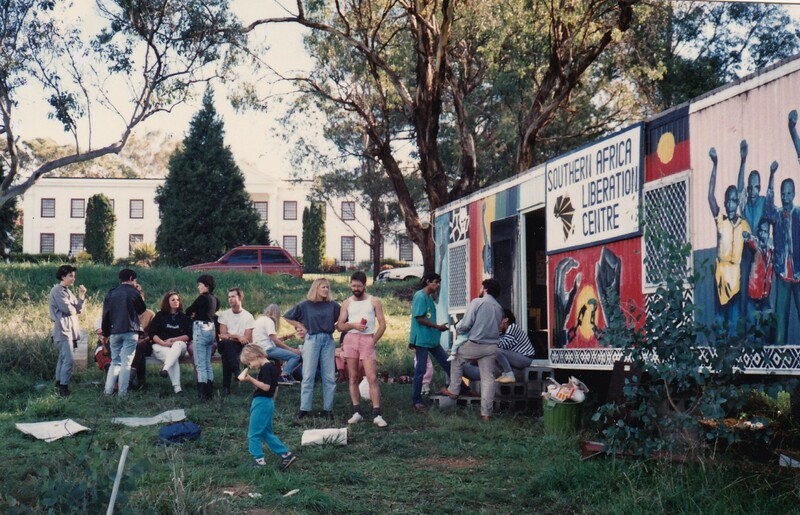 There, inspired by the Aboriginal Tent Embassy, protesters set up the South African Liberation Centre on a patch of land opposite the South African Embassy. With the aid of the building workers’ union, this became housed in a permanent structure. Although the South African Liberation Centre was not necessarily continually occupied, it nevertheless served as a constant reminder of opposition to apartheid in front of the South African Embassy. Solidarity protests outside South African consulates, high commissions and embassies around the world drew attention to the brutality of apartheid and contributed to international pressure on the South African government. Although these protests attracted participants of all ages, they were particularly successful in appealing to young people who wanted to take action against apartheid. Camps of a different kind attracted South African youth who wanted to take action against apartheid. From the point the African National Congress (ANC) and Pan-Africanist Congress (PAC) were banned by the South African government in 1960, the liberation movements set up exiled infrastructures outside the country. Cadre were smuggled out of South Africa and sent for military training in China, the Soviet Bloc and recently decolonized countries across Africa. In the 1960s, all of the countries bordering South Africa were still under colonial rule, providing a buffer zone for apartheid and a barrier to anti-apartheid guerrillas re-entering South Africa. In practice, once trained, these guerrillas ended up stranded in military holding camps in Tanzania, Zambia, and (later) Angola. From the 1960s onwards, hundreds of young people crossed the border and went searching for a guerrilla army to join. Many of them faced a long wait in the ANC’s military camps. Although some saw military action against the South African army in Angola, relatively few were smuggled back into South Africa to pursue the ‘people’s war’ they thought they were being trained for. Life in the Angolan camps was basic and could be boring. Paranoia about enemy agents was rampant and those who protested about their conditions or demanded to be deployed inside South Africa were often punished brutally (as Stephen Ellis and Paul Trewhela have, controversially, documented). Further research needs to be done to fully document life in these camps. Neither the participants in the international embassy protests, nor those left waiting in ANC (and PAC) camps across Southern Africa played a decisive role in ending apartheid. But the existence and presence of their very different ‘protest camps’ were (in different ways) of symbolic importance to the international campaign against apartheid. Any future study of the role of camps in the anti-apartheid struggle will need to take both formations into account. Similarly, both the long-term embassy protests and the exiled military camps disrupt taken-for-granted assumptions about what constitutes a ‘protest camp’. This entry was posted in protest camps and tagged ANC Camps, anti-apartheid protest, City of London Anti-Apartheid Group, Non-Stop Picket, Quatro Camp, South Africa, South African, South African Embassy, South African Liberation Centre, Trafalgar Square. Bookmark the permalink.